Got some more fan merchandise news! If you’re interested in helping him out, he’s apparently taking commissions, so if you have something you’d like him to make you, you can contact him here. You can also check out his flickr account here. 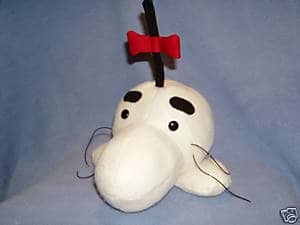 Next, there’s currently a hand-made Mr. Saturn plushie on eBay here that looks pretty cool. Also, if fan-made merch is your thing, check out this page, it updates every hour or so usually with the latest EarthBound fan-made merchandise on eBay. 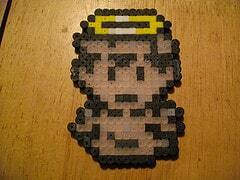 That dude’s bead sprites are really cool. I like how he’s not limiting himself to one series. Do you think he would be willing to make hybrids, like a Tony in a Kuribo’s shoe or something? Lakitu – you could always ask the guy. I’m sure he’d be able to answer your question better than any of us can. 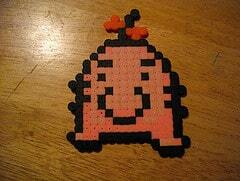 I’m amazed at how those bead things look EXACTLY like the sprites we’re all familiar with. That King Dedede one is super amazing. I would like to see the Tony in a Kuribo’s shoe. Awesome! I do the same thing too! The only thing is that I don’t have anymore money to buy beads! Noes! My most recent one was a perler bead Mani Mani Statue. Currently on eBay, there is a $20.00 ( plus a crazy 15.00 shipping) Custom Mr.Saturn plush. Its about 9 inches tall.